Get free photography handbooks worth up to £65 in our winter Sale! Get best-selling photography handbooks free when you subscribe to any of these top photography magazines. It is better than Black Friday! Subscribe to one of our leading photo magazines, and we'll send you free digital editions of four of our best-selling handbooks – worth up to an incredible £65. 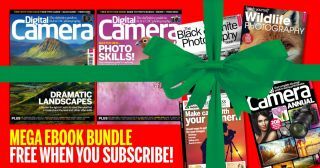 Subscribe to Digital Camera, the best all-round magazine for photographers, and you won't just get the 148-page magazine posted to you 13 times a year – but we will also you send you a free video disc every issue, and assorted bonus gifts, such as our popular tips cards. If you shoot with a Canon camera, then PhotoPlus: The Canon Magazine is the magazine for you. Published 13 times a year, and accompanied every issue with its Canon Skills video disc, it shows you how to get better pictures from your EOS SLR, advises you on what gear to buy next, and inspires you through the work of fellow Canon photographers. With subscriptions starting at just £12, your special Christmas bonus gift is all FOUR volumes of The Ultimate Canon SLR Handbook - giant PDF guides that provide over 900 pages of the most instructive articles from the PhotoPlus archives. Nikon fans should opt for N-Photo: the world's most popular magazine for Nikon SLR users. Packed with practical advice, interviews with top Nikon photographers, and expert guides on what lenses and accessories to buy, it is published every four weeks, and comes with an accompanying Nikon Skills video disc. Subscriptions start at £12 – with the special bonus gift of all FOUR volumes of The Ultimate Nikon SLR Handbook - 900 pages of advice that are the perfect accompaniment to your N-Photo subscription. Digital Photographer is the monthly photo magazine designed for the serious enthusiast and semi-professional photographer. With in-depth technique features written by professional photographers, and career advice, Digital Photographer is published 13 times a year. If you want to understand how Photoshop works and how to use it to create amazing images, you need Photoshop Creative. Every issue is packed full of practical advice and inspiring tutorials, plus you have access to over $10,000 of creative resources via FileSilo. Photoshop Creative is published 13 times a year. Subscribe now from just £12.65, and you'll also get four amazing digital handbooks worth £52!